Boston Blackie Booked on … Vagrancy??? A curious thing happened in Michigan in November 1914. 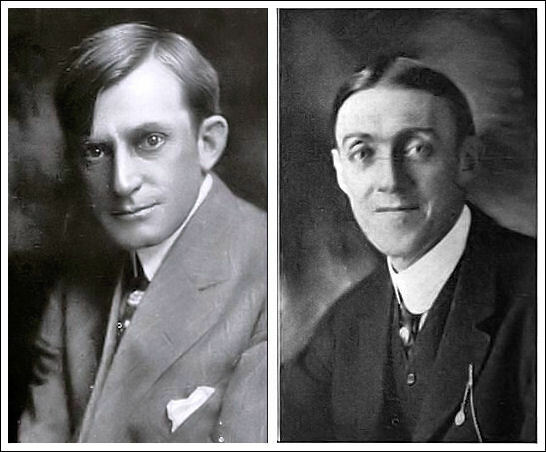 Just one month after Jack Boyle’s story “A Thief’s Daughter” (the final installment in the quartet of tales which introduced his most famous character to the world) appeared in The American Magazine, Boston Blackie was arrested in Grand Rapids. Before anyone thinks this is a story from The Twilight Zone, it should be pointed out that the name Boston Blackie had been around for years before Boyle appropriated it for his criminal protagonist. Newspapers from the early 1900s do not lack for Boston Blackies. 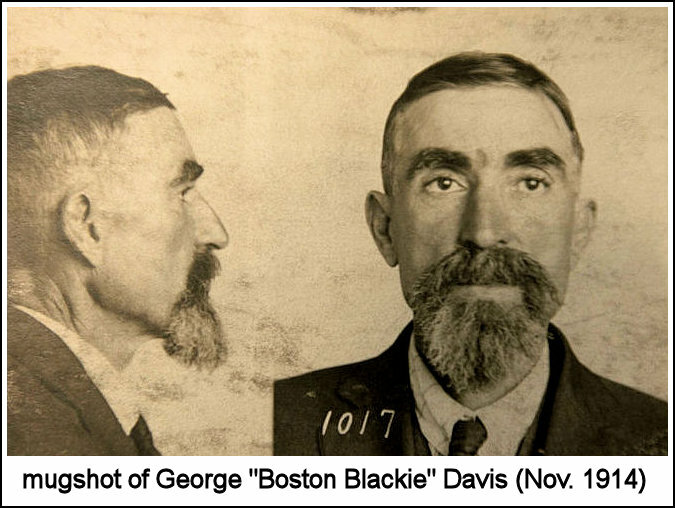 This particular Blackie was a man named George Davis, who was arrested in Grand Rapids for vagrancy. However, several years later Davis was arrested in the same city by patrolman Emil Roettger, who at that time identified him as “the notorious safe-cracker Boston Blackie.” So the history of Michigan law enforcement records that there really was an infamous safe-breaker named Boston Blackie. Jack Boyle on Death Row? In reality, the author of this piece managed to confuse Jack Boyle’s history with that of Boston Blackie. The story “Death Cell Visions” recounts the time Blackie spent under death sentence on a mistaken conviction. Apparently, since it was widely reported that the story’s author, No. 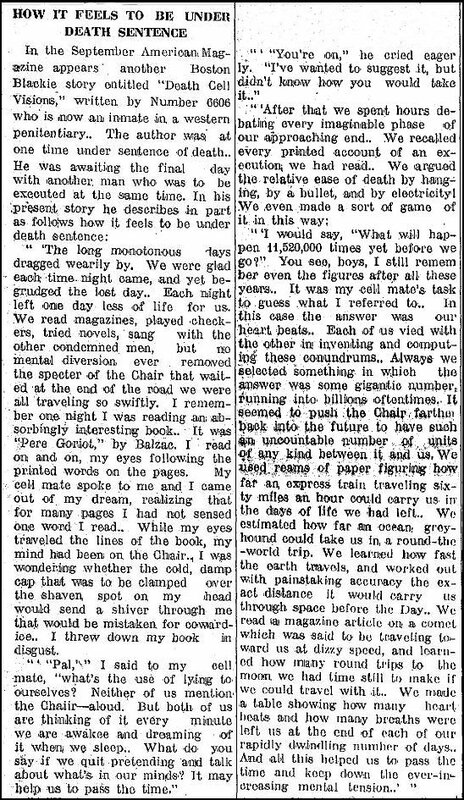 6606, was “a convict in a western penitentiary,” the person who composed this item for The Leader mistook Boyle’s fiction for a personal memoir. This isn’t too surprising, since Boyle often drew from his personal experiences in writing his stories of the underworld. And a handful news reports a few years later made the same mistake in reverse, confusing Boyle’s real life for his fiction. Some accounts of his arrests in 1915 and ’16 claimed that one of Boyle’s aliases was Boston Blackie. Strange how a writer can become mistakenly identified with his own creation. 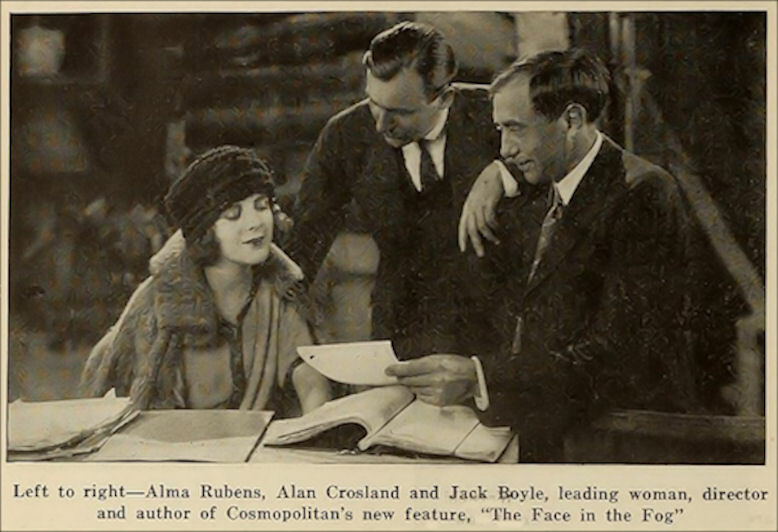 When The American Magazine published the quartet of tales which introduced Boston Blackie to the world in 1914, readers were treated not only to the watershed stories of Jack Boyle’s literary career, but also to the graphic artistry of a master illustrator. These early Blackie yarns were graced by illustrations from rising American artist N.C. Wyeth. Each story was accompanied by several original Wyeth compositions, all rendered in beautiful black and white. Several excellent artists illustrated Blackie’s magazine adventures over the years – W.H.D. Koerner and Lee Conrey, to name just a pair – but Wyeth’s work on the series is in a class by itself. Which makes it all the more exciting to discover a couple of Boston Blackie images that have never been published the way Wyeth originally rendered them. While The American presented these pieces gorgeously in black and white, the artist painted at least some of them in full color. So, while Wyeth’s work on Boston Blackie has been available to the public for literally as long as the character has existed, almost no one has seen the paintings the way they actually appeared resting on the artist’s easel. This first painting was highlighted in the October 1914 story “A Thief’s Daughter,” and features an image of Mary, before her marriage to Blackie, preparing opium for a group of her father’s friends. Blackie is among the group. And this image comes from the September 1914 tale “Death Cell Visions,” in which Blackie and his cellmate are visited nightly by a ghostly apparition. Regardless of Wyeth’s feelings regarding his commercial work, his illustrations for Boston Blackie’s debut run in The American are fantastic visualizations of Jack Boyle’s scenes, and are well worth the effort of any Blackie fan to view them. Many more are available on the Brandywine’s website, accessible simply by running the name Blackie though their catalogue’s keyword search. I highly encourage everyone to take the time to give it a look.